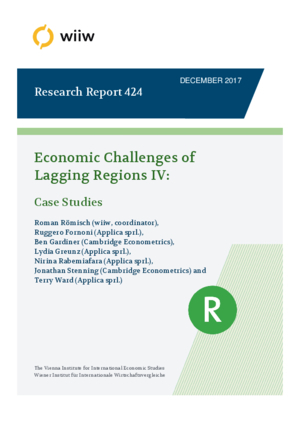 This report presents the findings of three case studies of lagging regions in the EU to deepen the findings of wiiw Research Reports 421 to 423. The three (NUTS 2) case study regions are the Italian Campania, the Portuguese Norte and the Romanian Nord-Est region. While each of these regions faces specific challenges due to their economic, social and geographic characteristics, they are at the same time to some extent representative of other EU regions that share similar characteristics and/or challenges. Each case study covers the economic development in the respective region, highlighting the main strengths and weaknesses in the region’s performance. Furthermore, each case study identifies the major, region-specific, causes of the observed developments. By focusing on those causes, each analysis develops a region-specific storyline on the success and failures in the regions’ economic development. Finally, each case study derives conclusions based on the above analysis. These conclusions should be indicative of potential development opportunities for each region and the necessary policy measures to overcome existing challenges in order to exploit these opportunities.